The set of buildings named Temple Israel in Westport were rehabilitated and enlarged. They consist ofadministrative buildings, a cultural center, library and temple. The articulation and connection between these buildings is through a newly created lobby. The lobby is also the main entrance and the reception area for all the buildings. 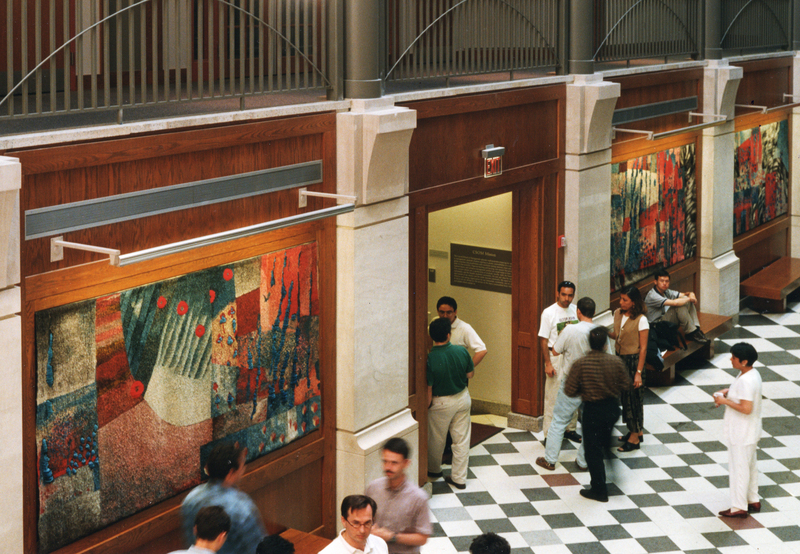 From the conception of this project, the architect, Barry Svigals, wished to make the lobby unique. 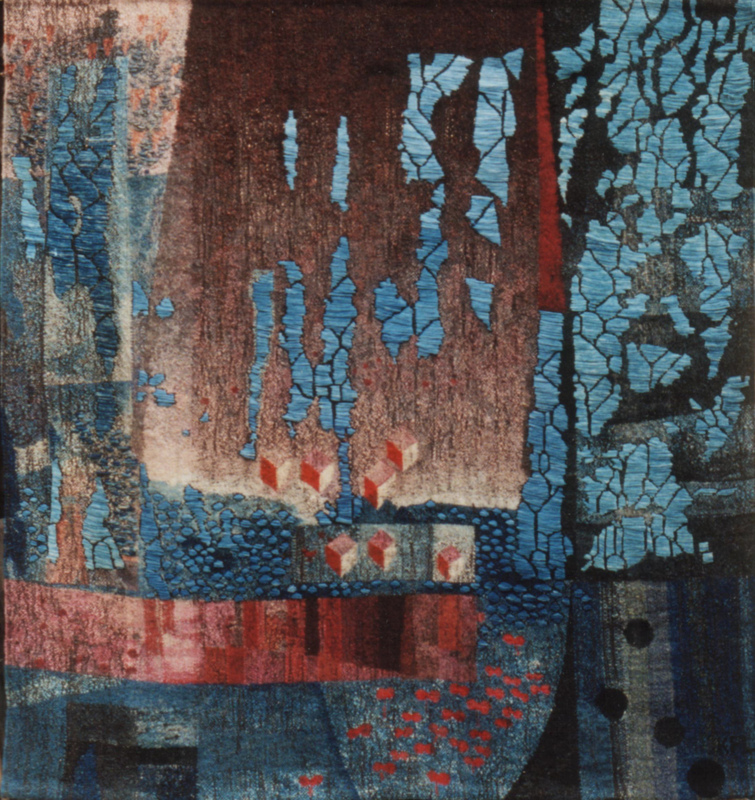 The choice to install tapestries was guided by aesthetic qualities and also by tapestry’s warmth and acoustic qualities. As the artist, no theme was imposed on me. However, as a space built by a cultural association, springing from a community of Jewish tradition, the founding element of Judaic culture, writing, and therefore the “letter,” imposed themselves on me. I had studied Hebrew calligraphy for a stained glass project and I was fascinated by the beauty of these signs. 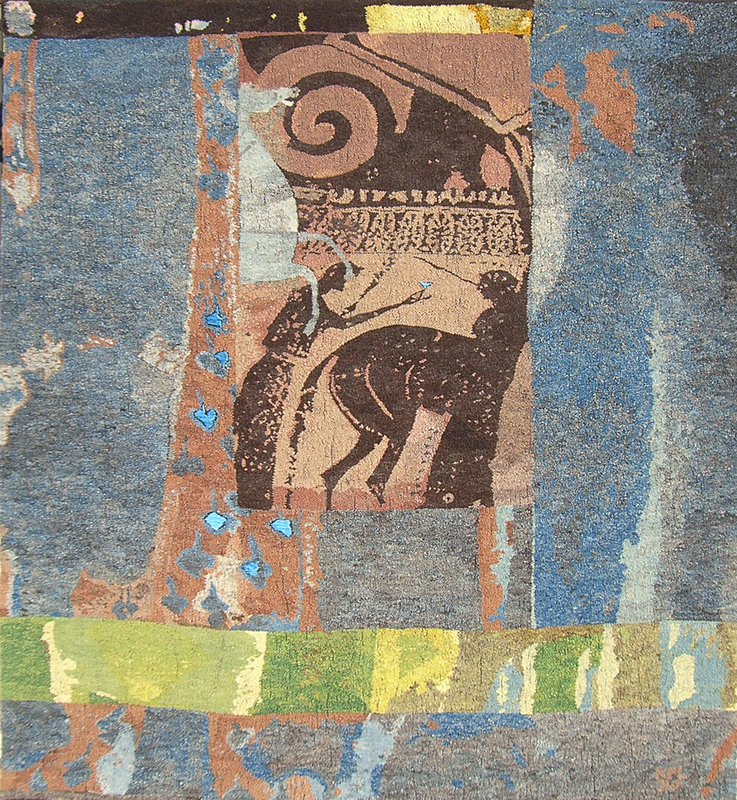 I made it the central theme of the commissioned tapestries. 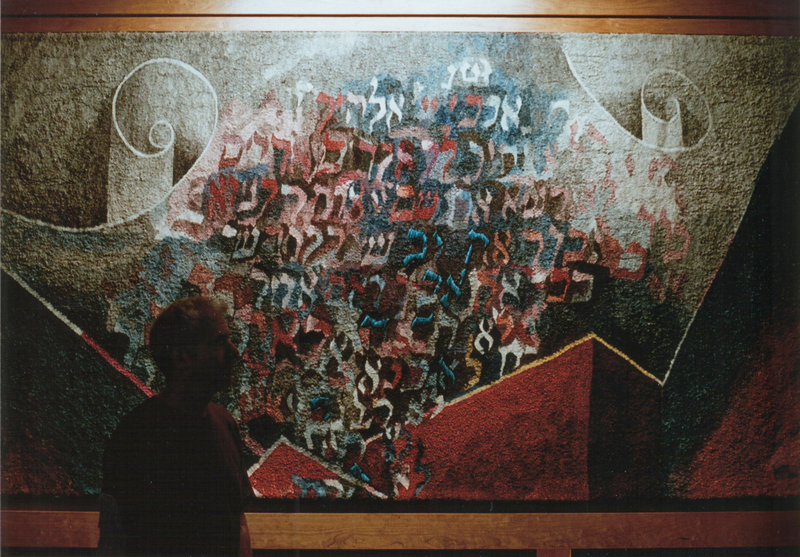 These were abstract, colorful compositions, built on the basis of a strong presence of calligraphy graphics, which combined in a poetic manner with elements of scrolls, evoking the spiral, a recurring motif in Judaic iconography. 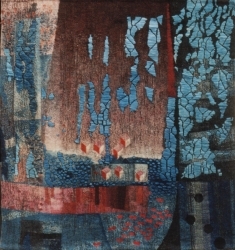 Employed in an abstract way, the elements were not the subject, nor did they convey any message – the community gathered around the Temple being secular. 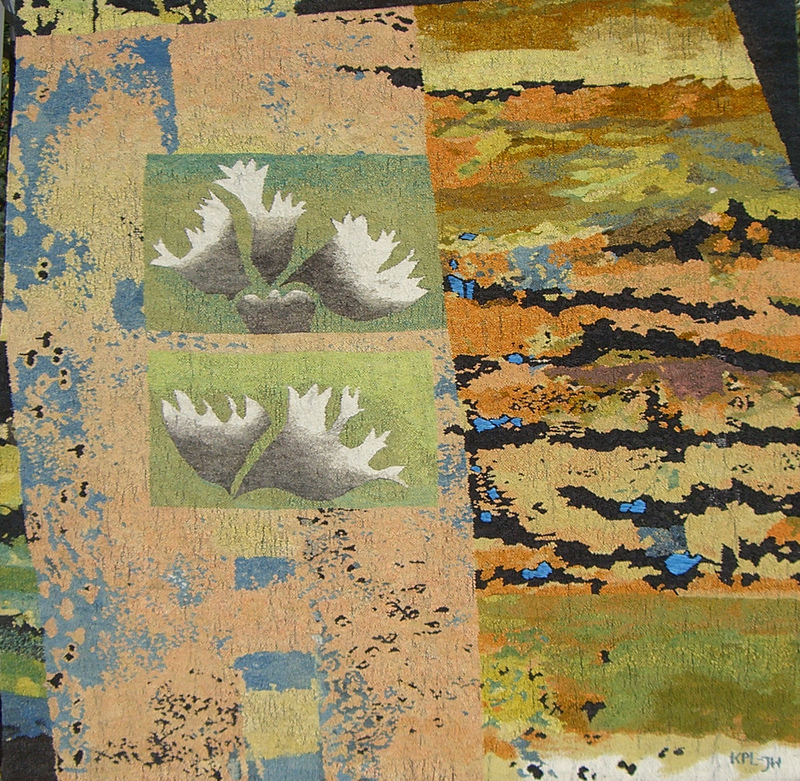 The community leaders chose two designs among several presented and the completed tapestries were received with enthusiasm. 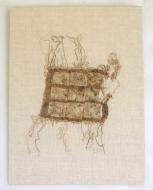 Katherine Lavocat, “Temple Israël-Rouleaux,” 62 in x 125 in (312 x 158 cm), 2004, flax warp, wool and silk weft. Collection of Temple Israël, Westport Connecticut, USA. Photo: Katherine Lavocat. 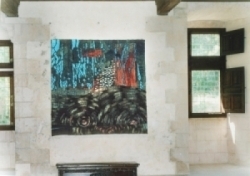 Four tapestries were commissioned for Fulton Hall, an atrium built to unite several older stone buildings of Gothic Elizabethan style with a modern extension. The multi-storey ground-floor lobby, lit by a glass roof, was a communication hub between several services and activities where teachers, students, employees and visitors crossed paths. Katherine Lavocat, “Paysages oniriques,” 63 in x 214 in (160 x 290 cm), 1998, flax warp, wool and silk, weft. Collection of Caroll Shool of Management, Fulton Hall, Boston College, Massachusetts, USA. Photo: Barry Svigals-arch. 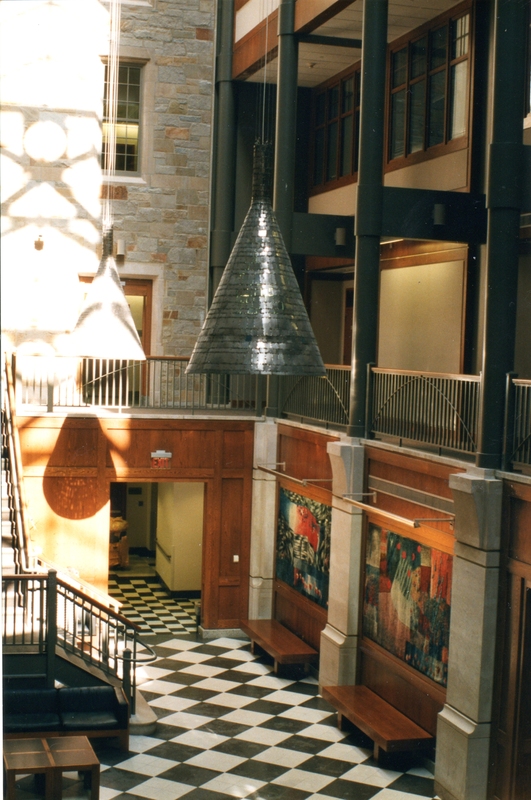 From the conception of the project, architect Barry Svigals viewed the atrium as a place of exchange and conviviality. 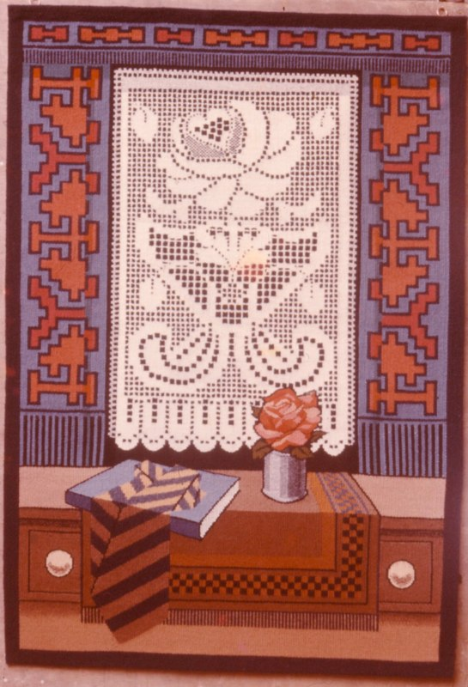 He advocated installing tapestries at a very early stage in his work. The choice to install tapestries was based on their aesthetic qualities but also because of the essential qualities of a colored textile. Tapestries made of natural, flexible materials have become indispensable in architecture using hard surfaces such as stone, softening and emphasizing the carved works of old facades. As a theme, I proposed the oneiric landscape, a subject that made me dream, and that I hoped would make the audience dream, at the same time soothing the austere atmosphere of the building, making it friendly. 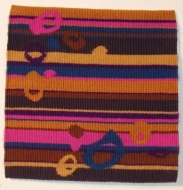 Soft lines, geometric shapes, colored dyes in natural materials – wool, linen, sisal, silk and natural dyes – were the basis of my composition. To unify the space and to satisfy the client’s wish that the lobby was unique, three chandeliers in welded stainless steel were suspended from the canopy. I was also the author of this work. 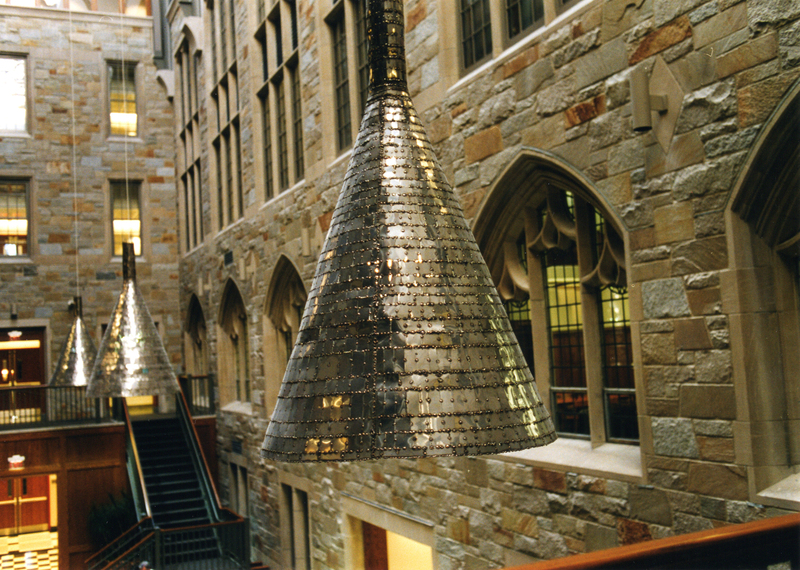 Katherine Lavocat, Chandeliers, Fulton Hall, Boston College, Massachusetts, USA. 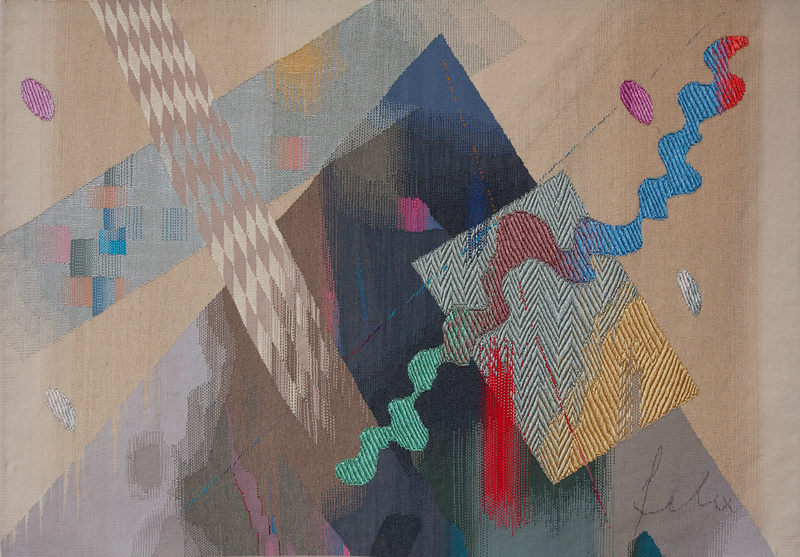 Katherine Lavocat, “Flavus transition,” 79 in x 79 in (200 x 200cm), 2006, flax warp, wool and silk, weft. Photo: Katherine Lavocat. Flavus in Latin means yellow. Transition is a way of linking ideas together, of moving from one discourse to another. Color is very important to me. I dye my wools with vegetable dyes: indigo for blue; madder for red; several plants for yellows – reseda, groundsel and St. John’s Wort, among others. It is these plants, with their infinite shades of delicate colors, that inspire my tapestries. To deepen the reflection around the title: Flavine – flavus – in biochemistry is a coenzyme involved in the transport of hydrogen atoms involved with respiration in the cell. It was the transition from an aesthetic emotion experienced in the presence of color towards reflection on the miracle of the respiratory function of an active dye that gave me the idea for the title. But the tapestry was not built around a title. It was born before, like most of my projects that are not the result of a commission. My approach is primarily plastic. 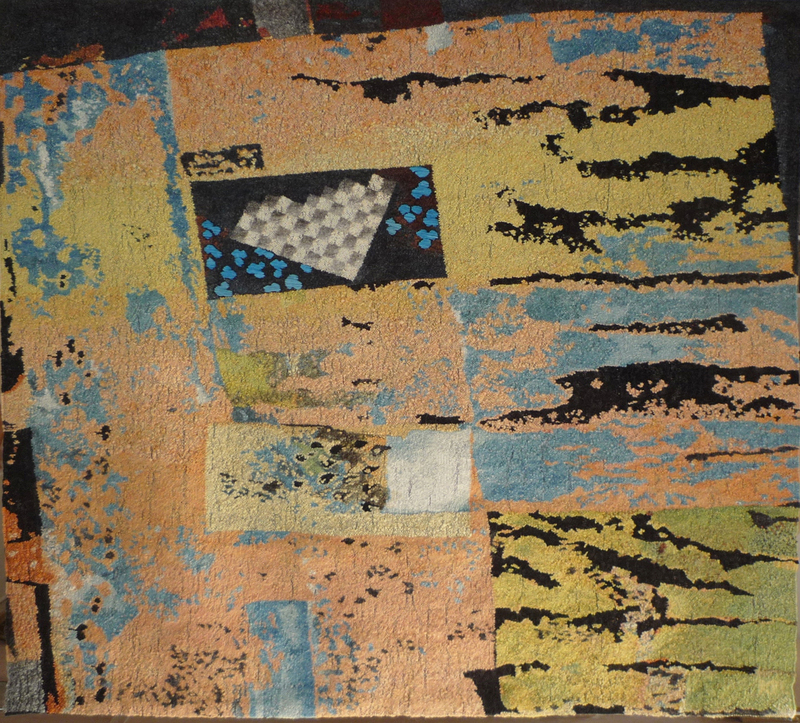 It materializes in a composition involving color and texture, the elements that characterize, in my opinion, a tapestry. 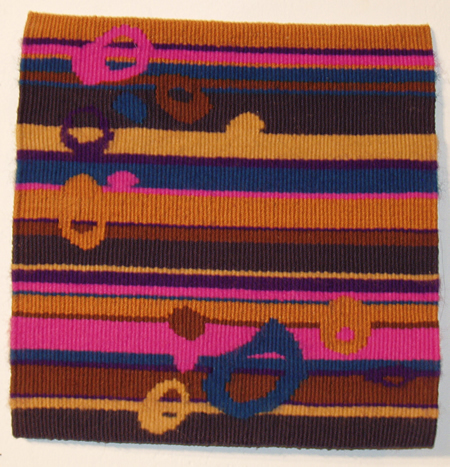 My titles often come after the weaving journey of many months and the daily contact with the materials. 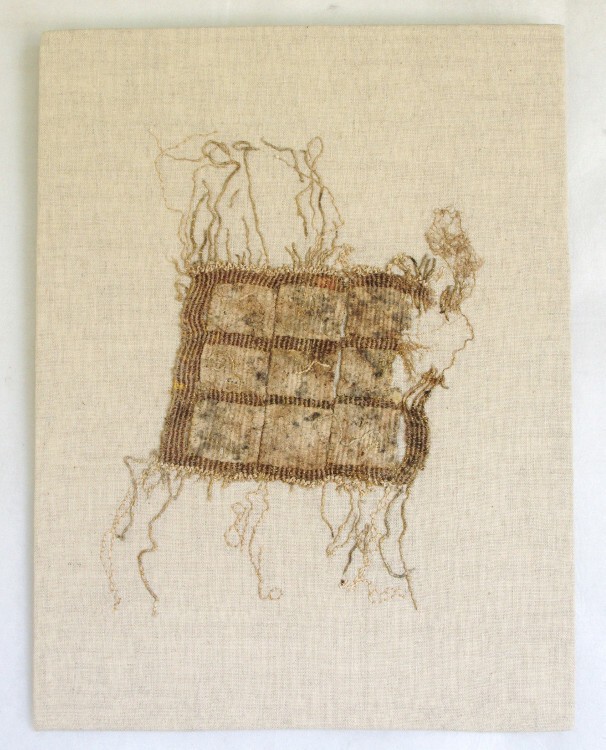 Katherine Lavocat, "Introspection," 67 in x 118 in (170 x 300 cm), 2002, flax warp, wool and silk, weft. 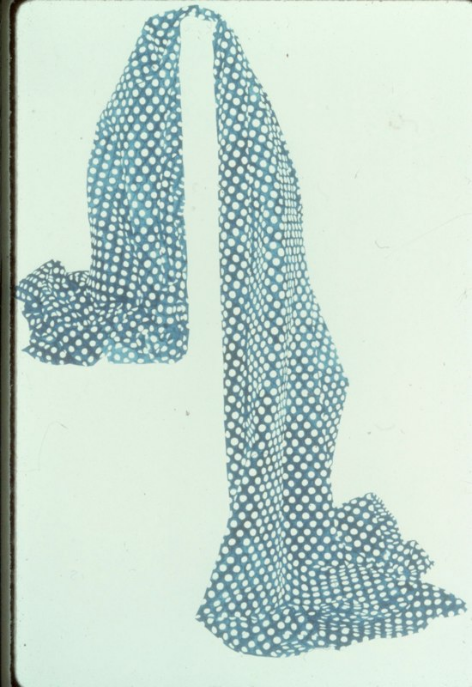 Collection of Worcester Polytechnic Institute, Campus Center, Worcester, Massachusetts, USA. Photo: Katherine Lavocat. Katherine Lavocat, "Introspection," detail. Photo: Katherine Lavocat. 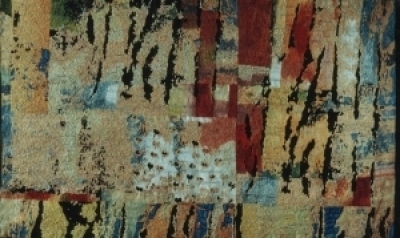 Katherine Lavocat, "Quadrature," 79 in x 79 in (200 x 200cm), 1995, flax warp, wool, silk and sisal weft. Photo: Katherine Lavocat. 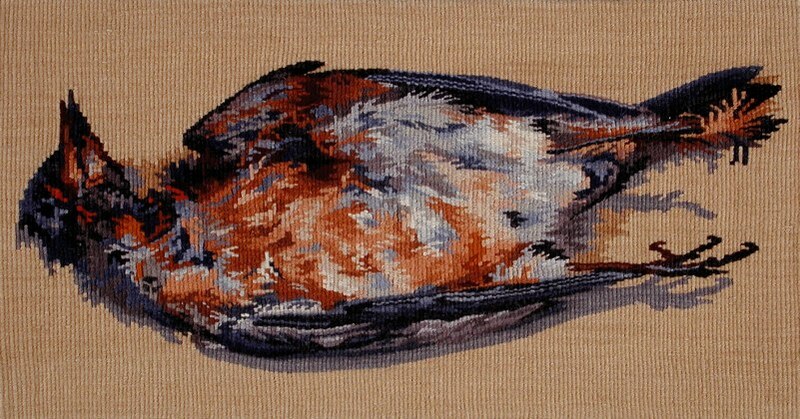 Katherine Lavocat, "Mythe Transformé," 85 in x 79 in (215 x 200cm), 2005, flax warp, wool and silk weft. Photo: Katherine Lavocat. 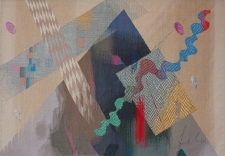 Katherine Lavocat, "Oecoumène," 71 in x 77 in (180 x 196cm), 2003, flax warp, wool, silk and sisal weft. Photo: Katherine Lavocat. 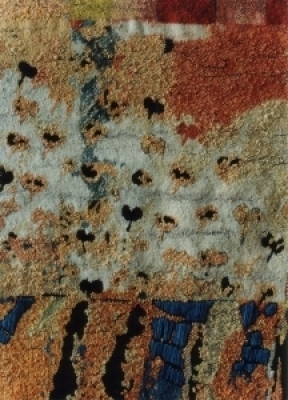 Katherine Lavocat, "Triennal," 83 in x 79 in (210 x 200cm), 1992, flax warp, wool, silk and sisal weft. Photo: Katherine Lavocat. To see more of Katherine Lavocat’s tapestries, please visit the G&O Art website.